of roofs because of the extensive benefit they provide. The selection of the plant type is important. Plants with aggressive root systems present problems for most waterproofing systems. Aggressive root system of certain trees, plants and grasses can grow through concrete, brickwork, through the laps around and down outlets etc creating a multitude of future problems. Anti-root chemicals are introduced into the bituminous matrix of the membrane (CG4H). The use of physical protection methods together with the correct choice of plants will prove a better solution. Use only plants with non-invasive, non-agressive shallow root structures. One layer Derbigum CG4H (horticultural) on one layer Derbigum CG3 waterproofing membrane, laid staggered, with 100mm side laps and 150mm end laps, sealed to primed surfaces by "torch-fusion" followed by 250 micron polyethene sheeting loose laid with 50mm laps sealed with pressure sensitive tape, to receive drainage layer of Delta MS8 to vertical and Delta MS20P to horizontal surfaces, to receive soil and plants (elsewhere specified). Waterproofing to be installed by an Approved Derbigum Contractor. The waterproofing is to be fully dressed into the drainage outlets to ensure a watertight seal. Outlets are to be positioned so that they are easily accessible both for the Waterproofing Contractor at the time of installation and maintenance purposes at some future date. Ensure that the level of the flange is kept below the screed level to prevent ponding around the outlet. 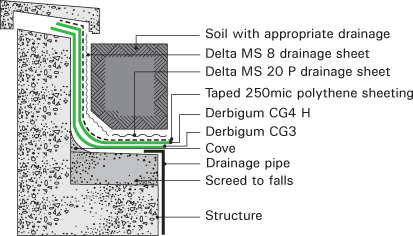 The integrity of the waterproofing system should be established by means of a flood-test of 48hrs – 72hrs duration, prior to handing over to the contractor. A certificate is to be obtained from the professional team recording the date and time-period of the test and that the waterproof treatment was handed over in a clean, proper and watertight condition. IMPORTANT NOTE: Discuss plant choice with a landscaper, use plants with non-invasive root systems / root structures to avoid damage to waterproofing systems.